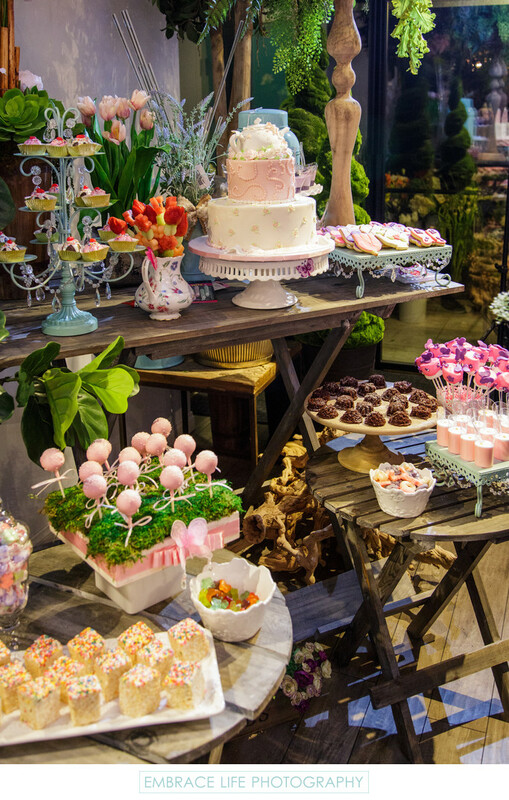 Rustic wooden tables with cake platters and bowls of many shapes and sizes displaying an amazing array of desserts at this little girl's garden tea party at XO Bloom in Westlake Village. The desserts include a two tiered cake with a teapot topper, tea pot iced cookies, cupcakes, fruit skewers, cake pops, rice cereal treats, candies and more. When photographing private parties, Embrace Life Photography is sure to capture all of the decor, details, moments and people, thoroughly preserving the memory of the event.